A carnivore might argue that if cows don’t want to be eaten they shouldn’t be so damn tasty, but unless you’re talking about boat people, blaming the victim can only take you so far. 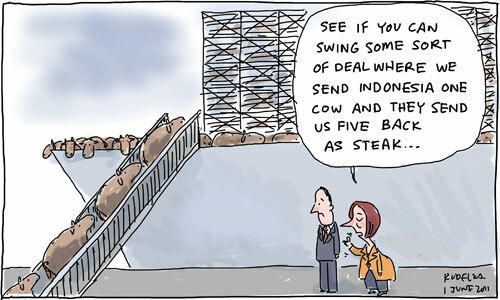 Hey, I like a steak as much as the next caveman, but the level of cruelty involved in the live export trade displayed on Monday’s Four Corners programme was truly shocking. However, as with offshore processing of refugees, I expect the out of sight out of mind principle will probably work its magic and after a few half-arsed gestures from the government it will be business as usual. Here I think the real point is that there’s no way to “ETHICALLY RAISE AND KILL”. Either we ETHICALLY RAISE or we NON-ETHICALLY KILL. So Indonesia is not the issue: our problem it’s all mass-produced meat worldwide. Any industry exists to satisfy customer needs so I guess if you want to make your part helping our planet one good thing would be stop eating meat. The Vegan Solution! Hahahahahahaha no.